This premium, luxury retreat destination is a natural sanctuary in Costa Rica that specifically focuses on collective group experiences, personal relaxation and immersive activities. We specialize in supporting groups and find that our regenerative, new-luxury mountain property - immersed in nature and furnished with organic, thoughtful amenities - is the perfect setting for yoga and mindfulness retreats, corporate and incentive events, social gatherings or simply a break from the busy world to reconnect with the joy of discovery. Seeking a quick getaway coupled with meaningful activities & life experiences? Check availability! Visit our ORGANIZED RETREATS page to join an upcoming retreat. Our natural sanctuary is a premium retreat, centered around alignment of the mind, body and spirit. Based in the heart of Costa Rica’s biodiverse Southern Zone, we are in close proximity to some of the most exciting adventures Costa Rica has to offer. Within each plate our award-winning and published chef strives to create dishes that celebrate the sustainability of the land through an artistry and diversity that is present within each bite. We support to groups of 10-45. 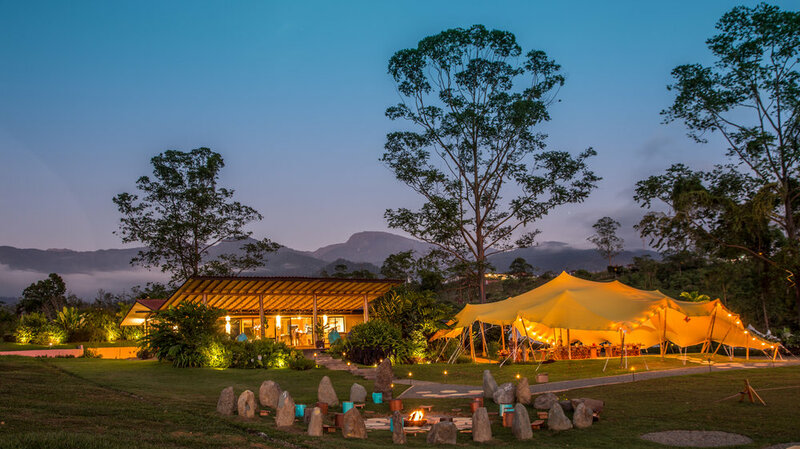 Our regenerative property is the perfect setting for yoga and mindfulness retreats, family gatherings, corporate team events or simply a break from the busy world. Our staff can easily facilitate programming and act as a support system for your group’s organizers, instructors and staff. Regeneration is at the heart of all that we do at Kinkára. This is highlighted by the way you’ll nourish your body and mind while on property. Our edible Mandala Garden provides guests with farm–to–table culinary delights unlike any other. Within each plate our award-winning and published chef strives to create dishes that celebrate the abundance of the land through an artistry and diversity that is present within each bite. Our kitchen is dedicated to consciously sourcing ingredients grown on our land, from local farms, artisans and small local producers. With a healing approach to the practice, we take each group’s or individual’s preferences into account. Whether you have allergies or are gluten–or dairy-free, keto, vegan, or pescatarian, we have options for any palate! Curious about beverages? Delight your senses with our signature cocktails and elixirs, local organic wines, hand-picked herbal teas, fresh-pressed juices and our very own house-brewed Kombucha. Designed around our signature immersive experiences, our unique activities are centered around nature, our farm, culinary program and overall wellbeing! From the highly physical to the deeply spiritual - Dive into yoga and meditation, revel in a river hike, learn about permaculture in an immersive setting, go horseback riding, take a surf lesson or zip line through the jungle, and even participate in team sports. Kinkára is all about balance. While we love spending time together we also cherish precious moments alone for self reflection or simply to calm the mind. Take a dip in our creek or get lost in a trance as you cozy up by the fire. Book a massage, enjoy the sunset as you journal in a hammock, or challenge yourself to a TRX workout–whichever way you like to unwind, you’ll be able to find something that speaks to your wellbeing. Fall asleep under a canopy of stars and wake up feeling refreshed as the sun rises to illuminate your interdimensional capsule. The luxury Lotus Belle canvas tents are fully furnished and netted to allow for fresh air flow and the most comfortable and reparative night of sleep you’ll ever have. Snuggle to sleep in our Organic 500-thread count cotton linens and locally made craftsman furniture. All tents are fully equipped with premium amenities including reading lights, plush robes, warm blankets, USB charging pods, jute carpets and Wi-Fi! Jumpstart your morning or refresh after a long day in our luxurious bath houses. Custom designed for Kinkára, you’ll sink into relaxation as you surround yourself with gorgeous local woods, oversized vanities, organic cotton bath towels, locally crafted amenities and powerful hot rainfall showers with incredible views into nature. These impeccably maintained, spa-like facilities are a highlight of our property. There is no place quite like Kinkára. We are a natural sanctuary for aligning body, mind and spirit and a platform for authentic group events and experiences. A place for learning, you’ll draw from nature’s ancient wisdom and reconnect internally as well as with others. As you’ll discover, the new path is an ancient one.